The 2009 Honda Accord Coupe straddles the sporty-or-sensible divide as well as any car in its segment. It's quick and responsive enough to satisfy all but the hard-core enthusiasts, and its rear seat and trunk are large enough that it makes a great daily driver. 09 Honda Accord review. Rapid oil consumption. I purchased this car with 89, 000 miles on it. I was hesitant but with Honda's reputation and my financial situation, I felt like it was the best decision at the time. I believe that the previous owner had issues with oil consumption and that is the reason they traded it. Quickly after owning it, I started hearing a grinding noise when I would accelerate. (I didn't purchase the extended warranty due to financial reasons. ) With this particular model, the piston rings were defective. I had many months and many trips to different mechanic shops trying to figure out why my vehicle was burning oil rapidly. I did my own investigating after many mechanics couldn't find the problem. I went to car complaints. Com and found numerous people with the same grinding sound and oil consumption. I noticed when I had the oil changed, I didn't hear the grinding sound until I had driven around 1, 000 miles. It was burning 1-1/2 quarts of oil every 1000 miles. After conducting a oil consumption test with the Honda dealership, a decision was made by Honda to rebuild the engine. The piston rings were sticking, resulting in rapid oil consumption. Since then, I have had no problems. It was rebuilt at 106, 000 miles and Honda provided an additional 20, 000 mile warranty. They also provided a rental car while they were rebuilding the engine. I have really not had any other problems with the car except for having to replace brakes more often than any other vehicle I have owned. I have had to get new rotors also. This seems to be an issue with this particular model as well. Overall, I love my car. It has everything I need in a vehicle. I love the heated seats, sunroof, nice stereo system, dependability and decent gas mileage. Reliability in any weather is guaranteed to satisfy any customer. I am almost 6ft. Talk, about 240 lbs. , the car has enough space for head room and legs to stretch and drive very comfortably and the passenger side too; the backseat is comfortable too but like any car of the same size, the sitting position is comfortable but of course you cannot stretch your legs as compared to both the driver and passenger side; very reliable and smooth to drive in the city limit and on highways; to date, not a single problem or issue whatsoever; at v6 engine, it is very silent but powerful engine when you need to; safety features such as power locks for the doors especially the back doors for children is an added value, sound system is superb and modern, most importantly, very comfortable and reliable in any four seasons. Price wise, the best investment money can buy. Style, it captures both younger and older generations. Maintenance by the automobile’s manual will guaranteed hi-performance and longevity, and most importantly, customers’ satisfaction. 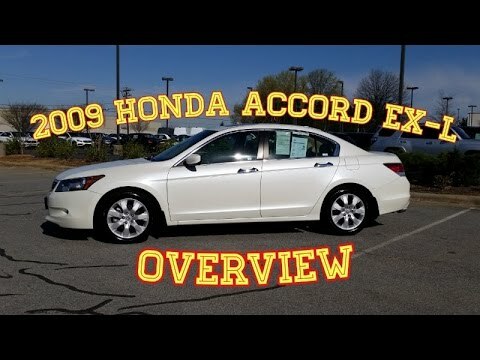 My review of my Honda Accord which is a reliable and fairly updated for a 2009. My vehicle has a lot of features that I enjoy even though it is only a 2009. I have an automatic driver seat and manual operated passenger seat. I have automatic windows, an AUX cord hook up, CD player, fabric seating, and automatic locks. The engine runs smoothly, however I think the car's pickup speed could overall be better, however, again for the car being made in 2009 it is running very smoothly and generally drives nicely. The car is very reliable, I have never had a breakdown or really many noise issues, other than normal required maintenance of course. One feature on the car that never really impressed me is the speakers, they are slightly fuzzy and I can never seem to understand my GPS through the speakers properly, however on other speakers it is definitely clearer. Honda (American Honda Motor Co.) is recalling certain model year 2008-2009 Honda Accord vehicles manufactured January 22, 2007, to June 30, 2008. In the affected vehicles, the side impact sensor calibrations may be overly sensitive, and as a result, the side air bag inflatable curtains and/or seat air bags may unexpectedly deploy when the ignition is on and the door is slammed or there is an impact with road debris. Honda will notify owners, and dealers will update the air bag control unit software, free of charge. The recall is expected to begin on December 14, 2015. Owners may contact Honda customer service at 1-888-234-2138. Honda's number for this recall is JV4.